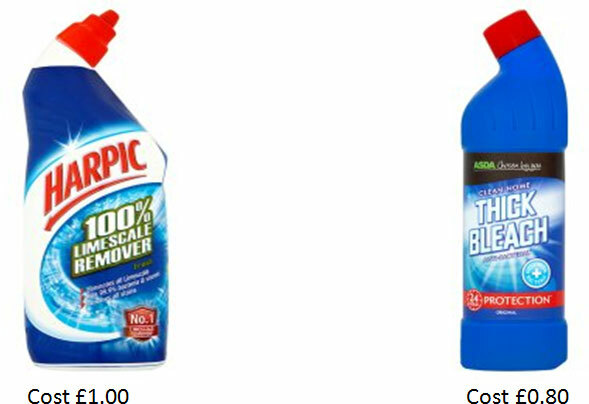 Dust clothes, paper towel, sponges, scourers, oven cleaner, multi surface cleaner, window cleaner, bleach, floor cleaner and something to get rid of the lime-scale in bathrooms like Harpic are the most vital cleaning detergents. You will spend roughly between £9 and £12.00 on all of these products. Perhaps you already in possession of a vacuum cleaner mop and bucket or flat mop you are prepared to start the cleaning yourself. Be advised that 1 bedroom apartment is cleaned professionally from recommended cleaning companies for the time of 6 to 8 hours. So if you are going to do the job yourself you will need to have half a day to accomplish all tasks. Make yourself ready, you are going to start with bedroom. By using dust clothes and multi surface cleaner you have to clean all wooden furniture, skirting’s, window frames, door frames, ornaments, wardrobes inside/outside, night stands inside/outside too. Then you can dust the light switches, door knobs, radiators, metal plates on doors if any. Once this task is completed you can clean the windows with the help of window cleaning spray. It’s very easy, use to spray the window and with the paper towel wipe it nicely. Please make sure you don’t leave any smear on the window itself. Don’t forget to wipe precisely too with paper around the edges. Final tasks in the bedroom are vacuuming the floor. After which you can get ready to mop if the floor is wooden or vinyl. All 3 products are from Asda stores. Task itself should be done for around no more then 30-40 minutes. You move into the living room, by using absolutely same materials and equipment you could start dusting all furniture around. Here you probably have a TV stand and TV wipe them down nicely. If your dining table is made of glass clean it with the window cleaner once is dust free. Wipe down apparently everything. Once this is done you again you can start the vacuum cleaner and clean the floor. After which you can mop the floor by using the Cif -wood floor cleaner and for smoother and better appearance you must use flat mop if you have one. Don’t disregard to dry dust any blinds in the living room. Wall spot cleaning is really helpful and can make the place look cleaner. Get a water wet sponge with a little bit of soap on it and with the rubber side start wiping marks on the wall, but do it gently without scratching it. Tiny amount of paint will come off but not much, that’s why you don’t have to worry. After turn sponge onto the soft side and wipe again. After task is accomplished leave the wall to dry then you will have an immaculate room. This task should take you around 30 minutes. Bathroom cleaning is one of the most difficult and time consuming part of the tenancy cleaning process. But with appropriate materials and detergents you will do it for an hour. Prepare following cleaning stuff: glass cleaner, bleach and Harpic. Apply bleach into the toilet bowl from the bottle. Leave it for 30 minutes and flash afterwards. If needed use the toilet brushes to scrub some clogging inside bowl. Spray and wipe down the outside toilet, toilet seat and toilet lead. Apply bleach onto the sink with a sponge. Be advised on that if your sink has granite or marble tiles you have to be careful and do not bleach them out. Bleach is used on porcelain made sinks. Get the bleach and apply more on the bath if you have one and on the tiled walls again only if they are normal porcelain. Leave it for 20-30 min. This thick bleach will get your stained grouting perfectly cleaned. Also will help the silicon to get whiter free of mould. Once you wash the sponge from the bleach you can start applying the same way on the glass on the bath glass shower. Also apply some on the taps, shower and undo the blocked shower head and soak it wet with Harpic but just for few minutes. Rinse afterwards with warm water it should be lime scale free, if needed use a scourer to scrub a small particles of scale left. After it’s all done with the applying bleach for whiten tiled walls, porcelain sink and toilet bowl and de-scale detergent for the lime scale removal you can rinse out with warm water. Dry tiled walls with the help of a squeegee, microfiber cloth or paper towel. Finalizing cleaning the bathroom is that you have to wipe down the rest inside it. Clean the cabinets, under and around the sink, wipe glass on cabinets. Wipe down the radiator and any metal driers. Once you have washed and wiped everything you have to polish the metal ornaments, taps and shower head by using simple paper towel. Once this is done you can vacuum and mop floor by using e little bit amount of bleach instead wooden cleaner. But please just put a tiny portion of it. The solution will help also disinfect the bathroom floor. Kitchen, oven, fridge and microwave cleaning, de- greasing. When cleaning kitchen you will need the above products plus the usual glass/window cleaner, multi surface cleaner and dust cloth. 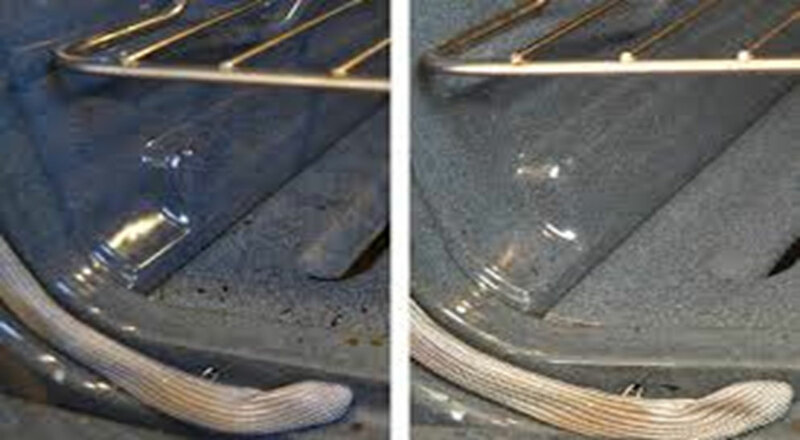 Oven cleaning is the most hardest task thats is why it needs a proper oven cleaner. From our exxperience we have tried many of them but Asda oven clean is one of the top cleaning detergents which will do a great job. I think it is even better then some commercial oven cleaning products. Don’t by Mr. Muscle oven cleaner this is not good enough. Take out all trays, raks, spray the oven glass and top of the oven. Take down the extractor filters and spray them too. Leave them for 30-40 min. After that spray again leave it for another 20-30 min. Even a third time is good to spray them cause it will help you at the end with the scrubbing. After 3 sprayings you can get the scoursers and strat scrub the left grease, it will be not many of it, because the oven cleaner will be done most of its job. After that rinse with hot water. Same procedures are for the greased glass and for the extractor panels. Its good to have a little scraper or little knife to scrap off some hard greased areas. Microwave is cleaned the same way and with the same chemical. Just when you spray with it dont inhale. Other easy way to clean it is to put a cup of boiling water mixed with 150 ml of lemon juice in a bowl in your microwave and ‘cook’ on high for 45 seconds. Once you displace the bowl you can wipe internally the microwave with a paper towel or damp cloth. All grease, food deposits should come off easily once wiped. It will help banish cooking odors too. Spray every part of the inside of the fridge with a multipurpose cleaner. Clean all walls, shelves, shelf seams, and the rubber door seal. Non-abrasive sponge is preferable to use you can easy remove sticky, caked-on spills, wine stains and others. Use a dry cloth or paper towel to wipe externally either with the multipurpose cleaner or just with the glass cleaner. Plug in the fridge again. De scale kettle and clean the toaster. Clean windows and window frames. Wipe down cabinet fronts and inside parts, dust and polish with wood polish. Wipe down decorative accessories, pictures, picture frames and other wooden ornaments. Clean light fixtures, clean switch plate, ventilator cover. Clean the washing machine rubber and drawer de scale it. Organize plates, caps, wine glass, pans or other frequently used under cabinet drawer. Scrub out sink with bleach and wipe down faucet. Then dry it with a paper towel or dust cloth. Wipe down countertops and polish it with dry cloth. Clean floor by using vacuum cleaner and then mop it. After 2-3 hours in the kitchen your job is almost done, don’t forget to hoover and dust cupboards or storage rooms too. Than you can clean the floors and wood works in the corridor as well. If you have mirror clean it too. At the end please wipe down the entry door both sides. Your job is completed and the end of tennacy cleaning is done. The task will consume around 5-6 hours and depends on how good you are. If you follow most of the steps you can be assured that the job will be conventional and you will have done the clean to a reasonable standrad and mostly which is aproved by letting agents and private landlods. The only money you must have to pay is presumably to hire steam carpet cleaner. But again this could be done from you too.